1) I have been watching Parenthood since the very first episode on March 2, 2010. At that time in our lives, we were a over a year into our own unsuccessful attempts to start a family, and I had started to let the infertility bitterness sink in. I normally stayed away from any kind of show that centered around pregnancy, or babies, or kids, or that seemed to glorify the thing I wanted but wasn’t getting: a family – but I surprisingly decided to watch anyways. And I even more surprisingly found myself enjoying the show and continuing to watch. Though I was bitter and angry about not having my own family yet, I could at least relate it to my own family I grew up in. I liked the Bravermans and wanted to be a family like them someday. 2) Kristina found out she was pregnant roughly around the same time I found out I was pregnant for the first time. So Nora Bravermen has always been around the same age as C, and seeing Nora on screen always makes KP and I smile because we think of our own daughter. 3) Adam and Crosby decided to open up the Luncheonette around the same time that KP and his partner started up their production company. No, the production company didn’t fare as well as the Luncheonette, but it was still a relateable enough storyline for us. It didn’t work out so well for KP and his partner, but I always kind of related it to the upstart potential of the Luncheonette. It’s tough starting something new and not knowing where it’s going to go. 4) Many ye ars ago, when KP and I were first married, we drove up to the Santa Barbara Film Festival for a friend of KP’s whose film was in the festival. 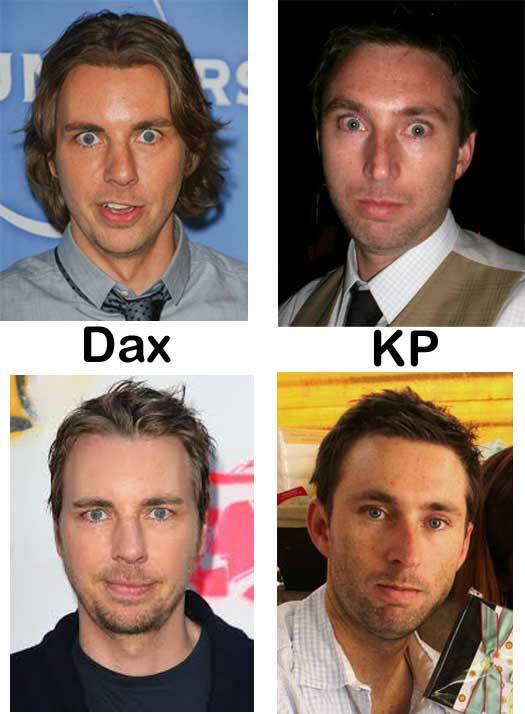 I don’t remember how it happened exactly, but while out at a local bar/restaurant, someone mistook KP for Dax Shepard (aka “Crosby”). Instead of correcting the person, KP played along and pretended to be Dax. The guy believed him. Our group was given a VIP table, and the guy sat with us and told KP how much he liked his work. To this day, I still feel a bit guilty that we fooled that guy and that he’s probably out there telling people about the time he met Dax Shepard. But it does make for a really funny story. 5) I just realized that I can only think of 6 things, not 7, so I’m going to drag this into two parts. Yes, yes, I know where I live and I know that I have a lots of friends and acquaintances involved in various parts of the entertainment industry and I should not be so fan-girlish about this, but over the years, I’ve known a few people who worked on the show in various capacities, and I always get all giddy about it because I love (loveD I mean, wahwahwah 🙁 ) the show so much. 6a) Back when I was a studio teacher and worked on set with child actors, sometimes a kid would really stand out to me as especially talented, or precocious, or adorable. I once worked on a Rice Krispies commercial with a 3 yr old little girl and I was super impressed with her ability to take direction. 3 years old is a HARD age (trust me, I have a 3 yr old right now…) and this little girl would actually listen to the director and go pick the flower, walk over there, dig in the dirt, and whatever else she was told to do. I still vividly remember playing with her in-between takes. That little girl grew up to play Sydney (Joel & Julia’s daughter). 6b) I work in the world of online/virtual K-12 schooling. I’ve worn a lot of hats and it’s too much to go into now, BUT at one point I ran a local community day program. One of the other Parenthood child actors was part of our school and we’d see him weekly. He was a great kid and had great parents. I really liked that family. 6c) When KP first moved to L.A., he met “Bryan” at the Oakwoods Apartments pool (those in L.A./entertainment will understand the humor in their meeting location) and they became roommates. I’ve known Bryan a long time, he was a groomsman at our wedding, and I consider him a real friend. Bryan is also an actor and you might recognize him because he’s been in a million commercials and had bit roles here and there (and his first staring feature role was this past summer!) and I wait for the day he makes it big! Anyways, Bryan had a small multi-episode arc in the 2nd or 3rd season. 6d) One of KP’s previous co-writers got a writing job for the 5th season of Parenthood. Which I still think is so cool and wish I could be her, ha ha. I think of her every single time I watch Parenthood and always want to thank her personally. 7) Lastly, but maybe most importantly, Joel and Julia’s crumbling marriage storyline resonated with me so much and I emotionally connected to like nothing else in the series. This should be no surprise and I’ve referenced Parenthood before in this blog. KP and I may not have had the same issues and may not have chosen to let our marriage deteriorate as far as theirs, but I definitely know how minor complexities left unchecked can slowly build up over time until they get to a point where reconciliation seems insurmountable. I get teary eyed when I think about Zeek’s encouragement that Joel fight for his marriage. I applaud the writers/producers/creators/anyone with any decision making power at NBC for showing marriage in a positive light, and for not assuming that trouble in marriage is impossible to overcome. I need to wrap this up (because otherwise I could talk about Parenthood for um, forever), but the most powerful moment, for me, of the entire last season, was a tiny, little, probably largely forgotten by the majority, scene. After deciding to get back together, Joel and Julia begin fighting. Julia says they need to talk about this stuff, and Joel says he knows but doesn’t want to fight. So they agree to meet later that evening to talk, even if things get a bit ugly. So then, that night, after the kids are in bed, they go and sit in their car (so their kids won’t hear them fighting) and they talk. They argue. They yell. They cry. They are each heard by the other. They forgive each other. And they work it out. And we see them the next morning in bed. Together. Marriage is hard. Life is hard. Parenthood is hard. But it’s all wonderful too.